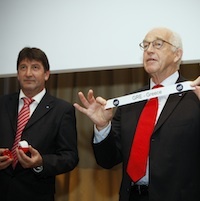 During the course of the EHF Congress in Monaco, the draw for the Men’s EHF EURO 2016 was made by the new and former chairmen of the EHF Competitions Commission, Leopold Kalin and Jan Tuik. A total of 38 nations teams have registered to compete in the Men's EHF EURO 2016 which will take place on 17 to 31 January 2016 in a nation yet to be selected. For the first time a new qualification system will be used for the EHF EURO, which will see Phase 1 played on a home and away basis in three groups of three teams. The change is aimed at providing Europe's emerging handball nations with more high level national team matches, and an opportunity to promote the sport at home to fans and the media as well as national partners and sponsors. The three winners from Phase 1 will progress to a knock-out phase, where they will meet the three lowest ranked fourth placed teams from EHF EURO 2014 Qualification Phase 2 in two play-off matches, home and away, on 2/3 April 2014 and 5/6 April 2014. The three winners of these matches go through to Phase 2 of qualification to EHF EURO 2016.